Incidentally, what a beautiful cover! I will start saying I might have conflicting feelings towards romances with "supernatural" traits, I must admit I'm not the biggest appreciator of those. I normally approach myself to them with a bit of involuntary distance if not even scepticism. Preamble enunciated, I have to say I liked this novel; it's very much catching, engaging and thrilling. 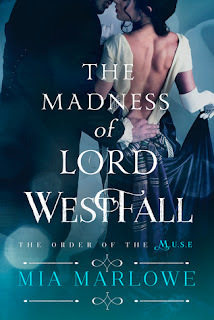 I liked the characters; they are all charming and I want to know what happens to all of them, I'm interested in each of their own stories and I'm looking forward to their happy-endings (especially the Duke of Camden and Vesta's one, which hopefully is going to be accomplished in the same novel). The protagonists, Pierce and Honora, are very suited, I liked them together, their attraction is strong and I loved their first meeting, how it's described, how the inner emotions are portrayed. I think, throughout the whole romance, the author did a great job in dealing with the transliteration in written words of Lord Westfall's gift. Pierce has the capacity to read minds and I believe that organising it so to be enjoyable, interesting and not burdensome for the reader is quite the hard work. In a romance, clearly, there are always the necessary hero and heroine's introspective parts, aside from dialogues, and in not few novels I found those parts to be slightly tiring, making the reading difficult and not particularly engaging. The Madness of Lord Westfall is not one of them. The part of the plot related to the M.U.S.E. (which is a sort of secret organisation, leaded by the Duke of Camden, that gather together people with supernatural capacities to employ those peculiar qualities in favour of the common good - something like the The League of Extraordinary Gentlemen) is honestly very interesting, I was really sort of fascinated by it, it's very fast paced and entertaining. So why didn't I give more to The Madness of Lord Westfall ? Simply because I did't adore how the love story has been developed. As already said, I really liked the protagonists, so my doubts are not strictly related to them as individuals, and I've also found them to be very sweet together, moreover I understand that Pierce's capacity cut down the timing normally needed to know if the feeling for the heroine is love or just affection, however I thought his realisation comes too soon in the story. Unfortunately this "small" aspect didn't permit me to develop that feeling of deep love which I look for in a romance. However this is a more than good romance, and I'm sure it is a must for those who like a twist of supernatural in a romance. For sure I'm going to read the rest of the series.